Ramblings from an Over-Squozen Brain: What will you look like in 20 years? Christian Challenge produced a drama entitled "The Father's Heart" that attempts to show the emotions of the Father in heaven while Jesus' life is played out on earth, both the joys of the birth and miraculous forgiving ministry as well as the sorrow and horror of the cross. I directed the drama the first two times we presented it (at Christian Challenge and at 1st Assembly) but the 3rd time we were to present it the gentleman who plays the Father was not able to be with us. So, as his understudy, I took on the role. The brother who played the Father originally has a beautiful head of white hair and a distinguished beard. I have red hair and goatee. Since I only had a week from the time I was to play the part until the actual presentation, I didn't have time to grow out my beard. (I tried ... just not enough man enough, I guess! [G]) So we looked for alternatives and settled on a white hair paint from a local beauty supply store. 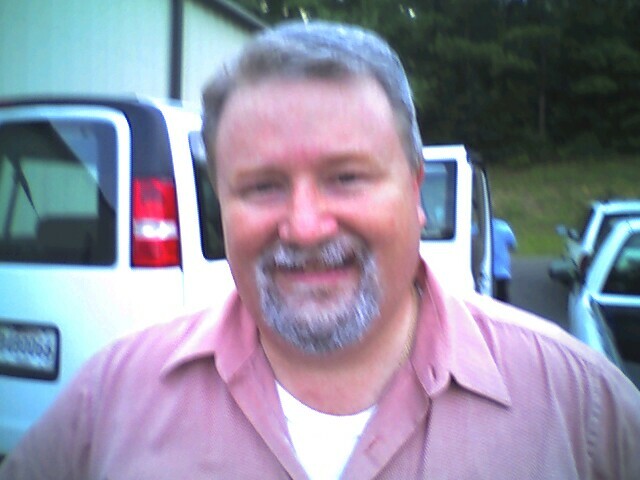 The night of the drama arrived and I dressed in one of the small Sunday School rooms behind the platform area at Sharp Baptist Church. There was no mirror there so I was not able to see the effect the hair coloring had after a member of our drama team sprayed my hair. The drama went off well and afterwards we received many compliments as well as quite a few comments about my hair. I finally got to see what I looked like and had my daughter snap the picture above with my cell phone camera. The most frequent comment I got was something like, "So this is what you'll look like in 20 years." That was usually followed by someone else commenting, "Nathan's got three teen-aged daughters ... that's what he'll look like in FIVE years!" I took all the good-natured ribbing in stride. But it got me thinking. What will I look like in 20 years, 30 years, 40 years? Obviously that picture doesn't capture it becuase it's just grey/white hair. What about the wrinkles, the crows feet, the sun spots? The more important question than what will I look like in 20 years is what will my spirit look like in 20 years? Am I continuing to nurture my spirit with the rich food of God's table? Will I be stronger, more mature, more patient, more caring, more compassionate? Or will I be harder, tougher, more cynical? I recently met a man who is the director of planning for Lafayette Consolidated Government. He gave me two cards, one for his contact information and one for "Lafayette in 100 Years", a long-range plan and vision for what the leaders want Lafayette to be like 100 years from now. That kind of planning is taking place in communities across our nation because people realize that growth without planning is a recipe for disaster. So what will you look like in 20 years? What do you want to look like? You get to choose.